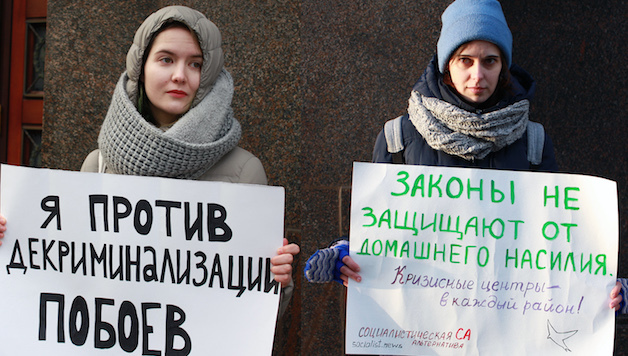 Socialist Alternative, the Russian section of the CWI, took part in an “individual picket” outside the State Duma (Parliament) on 17th January to protest against the first reading to remove from the criminal code the article making domestic violence a crime. As soon as the change was announced, a shockwave swept through social networks. The “individual picket” – now the only form of protest that does not need official permission from the state – is intended as a precursor to a larger protest. Our activists held placards declaring, “The law is no defense against domestic violence – there should be crisis centres in every region”. A larger protest unifying all feminist and women’s groups should take place on 28th January. It was planned for February but as the legislation is being rushed through, protest plans were brought forward. Normally a second reading takes over a month in the Duma, but this time they are allocating three days. However, the authorities, at the time of writing, are refusing to give permission for the protest, claiming that they are concerned that there will be “too many people” on the day of action. Every hour, even according to official statistics, one woman dies in Russia from domestic or partner violence. Every day six children die, on average, from the same cause. It is not difficult to suppose that each death is preceded by beatings but statistics about these are not collected. In this situation, when woman are psychologically and economically dependent on these tyrants, simply appealing to the police for help does not solve anything. Usually, the police are reluctant to even take statements. They often claim that victims should “sort out their own domestic problems”. The decriminalisation of domestic violence will finally deprive victims of any possibility of bringing the aggressors to justice. Unfortunately even good laws do not usually work in this situation. What is needed to save people from regular violent attacks is to set up a network of crisis centres in the localities. Anyone who suffers from domestic violence should know that there are people nearby who are prepared to give immediate help. Crisis centres should give not just professional psychological help and protection, but also offer temporary housing, assist in legal actions, help with finding jobs and offer requalification training. Too often, women have to tolerate this nightmare of violence because they are economically dependent on their partner, and cannot find anywhere else to live or a job to become independent. A programme to establish such crisis centres should be financed from the budget immediately. But crisis centres, necessary as they are, are an emergency measure to treat the symptoms, not the cause. It is necessary to face squarely the problem and fight against sexism and patriarchalism in a capitalist society. The difference in wages between men and women doing the same job in Russia is 30%. Even in the new IT sector, the difference is growing rapidly. Male professions, such as mining or driving, are traditionally paid more than female professions, such as nursing and teaching. We should unify all those who live from wage packet to wage packet, in a struggle to get equal pay for equal work. Right wing politicians argue that housework, the bringing up of children and supporting the family should rest on women’s shoulders. This is a justification for not spending on the social sector. We need free and accessible kindergartens, social cafeterias, and quality and free education and healthcare. The right wing politicians deepen the divide between men and women. They refer to the old reactionary notion that somehow women, by their nature, are “passive” and men “aggressive”. Sexism in education today has become the conscious policy of the reactionary bureaucracy. The conscious adoption by President Putin of what he calls “conservative traditionalism” has released the restraints from the ultra-right and clerical forces that increasingly dominate government policies. The new Minister of Education, appointed last summer, rages against the October 1917 Bolshevik revolution but is a fan of Stalin and the Russian Orthodox Church. She says children should help clean schools. The victory of Donald Trump in the US presidential elections allowed Putin to lurch further to the right. Last December, a parliamentary deputy, Mizulina, renowned for pushing through the new anti-LGBT laws, asked Putin to publicly state his support for the decriminatisation of violence. Putin replied he was against interference in the home. Only Putin could be behind the decision to rush through this reactionary, anti-women legislation law change. The fight against the decriminalisation of domestic violence should be the beginning of a wider movement of women who refuse to be dominated by men in this way. Together and armed with a programme for radical change in society, in the interests of the majority, working class women and men, we can win. Down with patriarchalism, down with capitalism! For the equality of the sexes and an equal society – For a democratic socialist society!